He was born Michael King in 1929 in Atlanta, Georgia. His father's name was also Michael, but he changed his and his son's names in 1934. Martin Luther King, Jr. and his sister in cap and gown at Morehouse College graduation. When King was a boy, he was troubled by the racism that black people often faced in the segregated South. At Booker T. Washington High School, he became known for his public speaking ability and was on the school's debate team. At the age of 15 as a junior in high school, King passed the entrance exam for Morehouse College. Although he did not graduate high school, he went on to earn a B.A. in sociology from Morehouse. He then enrolled in Crozer Theological Seminary in Chester, Pennsylvania. King married Coretta Scott on June 18, 1953, and they went on to have four children: Yolanda, Martin Luther King III, Dexter Scott, and Bernice. In 1955, when Rosa Parks was arrested for refusing to give up her seat on a city bus, King led the Montgomery bus boycott. During the 385-day boycott, King was arrested and his house was bombed. Ultimately, a United States District Court ruled in Browder v. Gayle that racial segregation on all Montgomery public buses was illegal. King stepped up to become the best-known spokesman of the civil rights movement. On April 4, 1968, at the Lorraine Motel in Memphis, Tennessee, Martin Luther King, Jr. was fatally shot by James Earl Ray as he stood on the motel's second-floor balcony. His legacy continues and his voice remains strong in America and around the world. Reenacts King's life, beginning with his childhood in Atlanta and his relationship with his family. Covers King's becoming a minister in Montgomery, Alabama, where he worked for equality for African Americans. Mentions Rosa Parks, the 1963 Washington march, his "I Have a Dream" speech, and that he received the Nobel Peace Prize. Does not mention his death. "Great resource for MLK Jr Day. Students enjoyed learning about his life. They really enjoy the biographies. Thank you!" "Loved the content and the facts that gave some background knowledge other than what is usually said about MLK. The boyhood information helped my middle schoolers relate to him better." "The kids were engrossed in this film. They really liked the reenactment format." The third Monday in January is a national holiday observing the birthday of Martin Luther King Jr. Learn more about this leader of the Civil Rights Movement. Part of the “All About the Holidays” series. 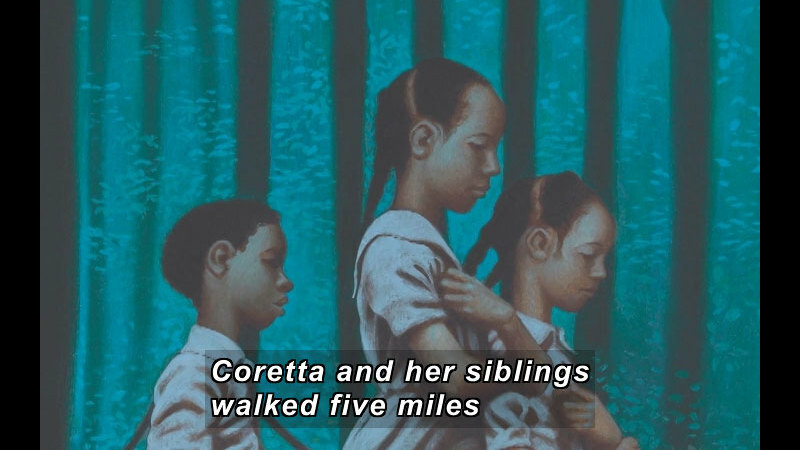 Walking many miles to school in the dusty road, young Coretta Scott knew the unfairness of life in the segregated south. A yearning for equality began to grow. Together with Martin Luther King, Jr., she gave birth to a vision of change through nonviolent protest. It was the beginning of a journey with dreams of freedom for all. Based on the book by Ntozake Shange. Maya uses a calendar to help identify America's national holidays. She begins in January with New Year's Day and shows how several ethnic groups celebrate it. Mentions Martin Luther King Day, Presidents' Day, Memorial Day, Flag Day, Independence Day, Labor Day, Columbus Day, Veterans Day, Thanksgiving, and Christmas. Offers a short explanation of each one. Part of Primary Citizenship Series. Chronicles the lives, passions, and contributions of African Americans who have left their stamp on history: Mary McLeod Bethune; Shirley Chisolm; Ida B. Wells; Fannie Lou Hamer; Paul Robeson; Charles Drew; Chester Himes; Thurgood Marshall.